"​A public relations and marketing executive until my retirement in 2003, I ended a 50-year painting drought by taking a watercolor class at the Springfield Art Association that same year. I discovered the basics were still there, but the skills definitely needed honing. My quest since has been to take as many classes as possible and paint, paint, paint. My current painting passion is pastels. While my style is always evolving, I believe expressionism would best categorize my present efforts. I paint what I love – the American Southwest where I was raised, France where we often visit, and the Tall Grass Prairie area where we now live. 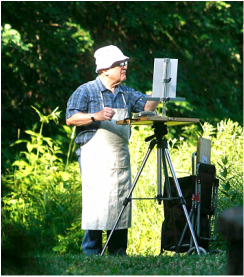 Most of my work is crafted from a combination of plein air sketching and on-site photos with completion taking place in the studio. I believe I paint best when I’m inspired by place and circumstance. I strive to paint my very personal impressions of those fleeting moments using color and composition to achieve my goal. While largely self-taught, I have taken workshops from noted pastel and oil painter Michael Chesley Johnson, Pastel Painting Hall of Fame artist Doug Dawson and pastel and oil painter M. Katherine Hurley. Peer counsel and criticism are also available to me through weekly pastel open studio sessions which I attend. And, I am constantly inspired and influenced by artists such as Dawson and Johnson, Nellie Knopf, Al Nestler, Maynard Dixon, Albert Handell, and Paul Cezanne. My paintings are in private collections in Illinois; Ohio; Ontario, Canada; Mexico; and France."